It's that time of the year again! We've just gotten thru Halloween, the trick or treat buckets are still full of candy and yet the holidays quickly enter our minds, at least for us moms! We start planning and thinking about Thanksgiving and Christmas and so much more! For me as a portrait photographer, I love this time of year for the beauty nature brings! My style of family portraits is very natural and I love taking advantage of the fall foliage as a backdrop! Staten Island's north shore has some really beautiful spots that I want to take advantage of before the winter chill sets in! 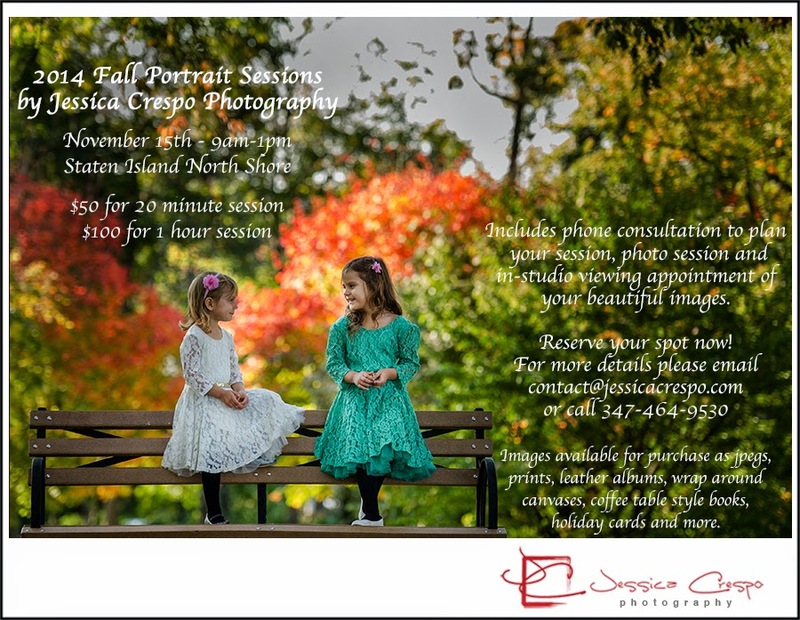 For the first time ever, I'm offering a very special holiday special for family and children's portraits on November 15th from 9am to 1pm! $50 for a 20 minute session or $100 for a 1 hour session. A regular 1 hour session is usually $350 for family and children's portraits! This includes a phone consultation to plan your session, photo session and in-studio viewing appointment of your beautiful images. Images are available for purchase as jpegs, professional prints, wrap around canvases, albums, coffee table style books, holiday cards and more.